EUR/USD, 1.1320 will fall today! It looks that the bulls will finaly manage to brake 1.1320, the strong resistance for the previous two weeks, but the fight is not over yet. 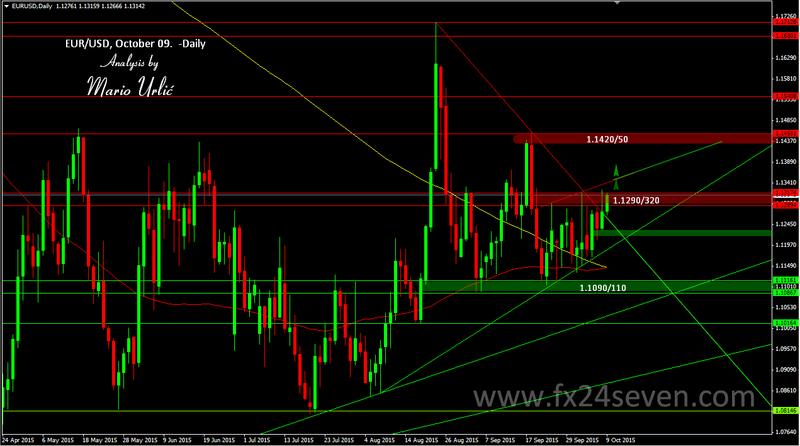 There is trendline at 1.1335/40, that must be broken as well, if the euro bulls want to reach 1.1420/50 again. The pair looks bullish and this could be the right time for testing a new levels on the way up. As you could see, the daily MA’s 100 & 200 are crossing over today and that could also be the ‘positive sign’ for the euro bulls. As I see it, the euro times are coming up, the bulls could start to build a new strong support levels if they broke this today!? Watch this trendline, as I see it, it’s very important for furder gain. After possible break, 1.1290/320 will be the first support on the way back, in the smaller time frames. But, this is daily chart and possible fail break is possible as well at the end of the day. This could be an important day for the main currency pair.